Three manuscripts held by UCC will be on display in Special Collections, in the basement of the Boole Library: the Regensburg Fragment, a 12th-century manuscript fragment from one of the Irish monasteries on the Continent, containing part of a litany of saints; UCC MS 96, written by the 18th-century Waterford scribe Labhrás Ó Fuartháin, with a copy of the Fenian text Agallamh na Seanórach; and UCC MS T.i, with a copy of the uniquely Irish Arthurian tale Eachtra an Mhadra Mhaoil written by the 19th-century Cork scribe Donncha Óg Ó Floinn. 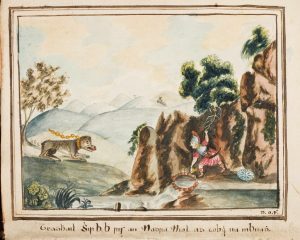 UCC MS T.i: Frontispiece illustration opposite title page to Eachtra an Mhadra Mhaoil. Special Collections, Boole Library, UCC. Special Collections, located in the basement of the Boole Library, is open Thursday and Friday, 11.00am-1.00pm and 2.00-4:30pm. Through the kindness of the staff, it will remain open during the lunchtime slots, 1.00-2.00pm, for those wishing to view the exhibition; there will be a ‘Closed/Dúnta’ sign on the door, but a member of staff will be on hand to welcome visitors. Delegates should show their conference badges at the library security desk. The Conference Agenda [PDF] of the 32nd ICM, along with abstracts of the individual papers [PDF], can now be downloaded. These may be updated to reflect any changes to the programme in advance of the conference. Registration now open for the 32nd Irish Conference of Medievalists at the UCC Shop.